projectREACH: IMAN Inspires Change in Washington, D.C.
projectREACH, a local effort focused on Muslim youth from the Washington D.C. inner-city, has grown out of IMAN’s D.C. initiative . IMAN has always envisioned that Muslims in other urban centers would draw on its model for dynamic civic engagement in their communities and the larger society. As several Muslim communities expressed persistent interest in bringing IMAN to their cities, we launched the D.C. initiative to study the challenges and opportunities that other urban centers could bring. Early on in the IMAN D.C. initiative, the needs of the Muslim youth were recognized as a priority by local leaders and projectREACH has grown around the desire and efforts to meet those needs. 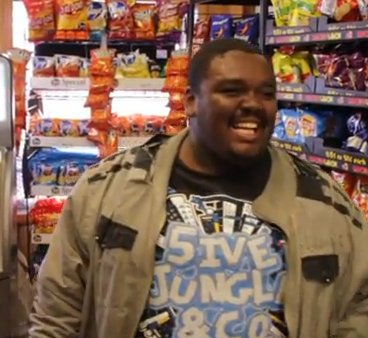 projectREACH envisions youth becoming agents of social justice within their communities. This will be achieved by preparing them to lead service-centered projects aimed at addressing needs that have continued to affect the wider population within D.C.’s inner-city. Volunteers are working hard on the ground to respect youth and families, understand their current life realities and build authentic trusting relationships with them and local community stakeholders. The vision also includes a physical location that could serve as a safe “third space” for community dialogue, cultural/artistic events and an entrepreneurial creative hub. 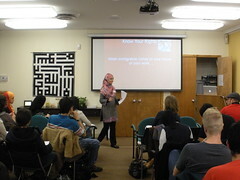 projectREACH organizes seminars and workshops to address areas of concern for local youth–such as avoiding the criminal justice system and providing practical guidance for seeking employment; it facilitates their exposure to Muslim creativity in the arts; it involves them in enriching community service experiences; it does basic math and language arts tutoring; and, last but not least, it organizes long-distance trips (e.g. to Philadelphia, Knoxville) and overnight camping retreats for youth. In June 2010, a busload of youth from IMAN’s D.C. initiative had also traveled to C hicago, to both visit IMAN and attend Takin’ It to the Streets. The common thread that brings all of projectREACH’s programming together is an emphasis on self-development and community empowerment. In November, as part of IMAN’s continuing commitment to growing leadership, building capacity and developing organizing models for projectREACH, IMAN staff conducted a full day of organizing training in D.C. for its core leadership team and youth. This training introduced leaders and youth to grassroots organizing concepts and strategies, and provided a framework and common language to begin the longer-term strategic planning process for projectREACH. As a result of its consistent efforts and relationship-building over the last two years, projectREACH has secured valuable local resources and partnerships. As projectREACH leverages these resources and relationships to improve and expand services, IMAN and its leadership are committed to staying closely connected by providing both models and on-the-ground help for engagement with the inner-city communities in Washington D.C. Watch this space for updates. 2011 has arguably been the most progressive and successful year of IMAN’s ongoing Muslim Run Campaign for Health, Wellness and Healing. In contrast to the big-business based solutions to food desserts that would see massive grocery corporations open their smaller, less staffed and less stocked storefronts in the very same places that their premium stores abandoned, Muslim Run is promoting a vision that still values local ownership and small businesses. We believe that if this campaign can demonstrate the ability to mobilize an entire community to work with storeowners to produce a store model that is dignified, beautified and respectful, we can reduce and eliminate the need for any chain grocers in low-income communities across the city and country. This year, four stores in the West Englewood community of Chicago signed on to IMAN’s campaign; Payless Grocers, our most continuous and committed partner, Stop Shop Mini Market, Eddies Food Mart and Miami Foods. These stores were secured after several months of outreach and relationship building that has culminated in opportunities for the community, the stores themselves, and IMAN’s overall vision. In addition to receiving new signage and other help to increase food traffic, each store will become a site for the distribution of IMAN’s health and wellness education curriculum. Developed with IMAN’s Arts and Culture department as well as the Free Health Clinic, the curriculum will be a holistic program that addresses living healthy lifestyles and the dynamics of inner-city stores and community relations. Through a partnership with Chicago’s Healthy Places initiative, one store will receive resources for beautification such as lighting and floor repair, as well as new refrigeration. We are proud that this year alone, both Payless Grocers and Miami Foods have begun to clear out space in their stores for new produce sections and begun conversations with local residents about what types of foods they would like to see offered. With the continued support of our leaders on the Muslim Run steering committee and working groups who really pushed the campaign forward this year, we expect 2012 to be even more productive. In addition to the full implementation of the grassroots education curriculum within the stores themselves, IMAN plans to host nearly 30 residents and storeowners in training that will build strong relationships and increase awareness around healthy living and policy education. While the Illinois legislature approved the Fresh Food Fund in 2010, they have yet to appropriate funds so IMAN will continue to push forward on this effort with increased advocacy in both Chicago and the state capital of Springfield. 2012 will also witness the fusion of art and organizing at IMAN in a very organic way as we dedicate at least one Community Cafe to educating and mobilizing around the campaign, including an interactive workshop the next day showing the audience how to truly engage with these sometimes-evasive issues. The landscape of food access in inner-city Chicago has changed over the past five years and Muslim Run has been able to adapt and remain a viable program for community members and storeowners. While 2011 brought great strides, we understand that the success of this campaign is contingent on the development of a sustainable and replicable model that can be used in low-income and inner-city communities across the country. Each step in this process toward creating a more just food environment has brought clarity about the complex nature of the problem. So long as community residents continue to buy in, store owners continue to partner, and you, our base, continues to support our work, we’re confident that the Muslim Run Campaign for Health, Wellness and Healing is better positioned now than ever before to bring real, systemic change to the Southwest Side of Chicago. Making the best of Chicago’s famed winter season, IMAN’s 2011 End of Year Dinner: “A Celebration with Soul” was aptly held at the Harold Washington Library’s Winter Garden. The beautiful venue as well as the décor and art contributed by IMAN staff and artist eL Seed set the stage for an event with high ambitions. Throughout its fourteen year history, IMAN has regularly taken time to produce similar events highlighting our work, bringing our communities together, and of course raising some money for the work we do. This year, we aimed to do the same with another unique IMAN twist. Guests entered our beautifully decorated venue to the wonderful jazzy and soulful sounds of the band Zzaje that gave a nod to the catalog of music producer extraordinaire, and the keynote speaker for the night, Kenny Gamble. Beyond the aural delights of Zzaje, guests were visually stimulated by the cutting-edge artwork of eL Seed, a Tunisian artist that seamlessly melds together Arabic calligraphy with graffiti art. All of eL Seed’s work was created in three days exclusively for our event. Food was catered by our good friends at Cedars of Lebanon who gave their traditional Lebanese cuisine a touch of soul, again highlighting what IMAN does so well, bringing communities together beyond the traditional barriers. The event focused on highlighting our work with the Green Reen try project, Health Clinic, and Muslim Run: Campaign for Health, Wellness and Healing. 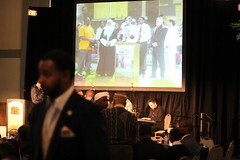 Aligning with this and our Soul theme, we presented two heavyweight speakers – Imam Suhaib Webb and Brother Kenny Gamble also known as Luqman Abdul Haqq. Both speakers really touched the audience, with Imam Suhaib highlighting the relevance and timeliness of IMAN’s work and Brother Kenny Gamble connecting his own story and work to that of IMAN. I believe Imam Suhaib’s closing statement said it best, “The spirit of IMAN is a spirit that is transformative and transcendent and is linked to this merciful spirit that the Prophet has taught us. And it is extremely important that we see this legacy continue through an historical city like Chicago.” I was personally very moved by the performance of Three Generationz. For those who still haven’t seen these IMAN favorites, the group carries on the tradition of three generations of women who fuse together Native American songs and African American soul with a Muslim sensibility. Although it may sound confusing, the best way to experience this is by listening to their version of Tala’ al Badru ‘Alayna, a praise song for the Prophet (Peace and Blessings be upon him). The sold out event, brought together the beautiful people of our IMAN community with an energy that is rare in the middle of Chicago’s winter. We didn’t meet our fundraising goal, but you can always help out by donating now. And for those who want a piece of the event or just love good original art, we actually have all of El Seed’s exclusive and original art work for sale. 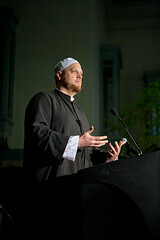 Check out the images here and e-mail asad@imancentral.org to inquire about pricing. You can also stop by the IMAN office to see the pieces in person. Over the past decade, IMAN has remained engaged in the struggle for the fair treatment of immigrants by being both an active organizer and an ally in movements for comprehensive reform of America’s broken immigration system. In partnership with the Immigrant Youth Justice League (IYJL), Southwest Organizing Project (SWOP) and the Mexican American Legal Defense and Education Fund (MALDEF), we started the month of November returning to the issue in the most practical way possible: A Know Your Rights Workshop. On Saturday, November 5, we welcomed over 40 undocumented Latino and Arab residents to our office for a three hour training that provided resources and information, dispelled myths about dealing with law enforcement, and gave participants a better understanding of what could be done in their personal situations. The workshop began by establishing that everyone in the room, despite their immigration status, is an invaluable asset to the human community and deserves to be treated with a basic level of dignity. We explored the dehumanizing effects of the term “illegal alien,” which destroys the necessary compassion with which law enforcement officials should be serving their communities by placing undocumented individuals outside the realm of “human” and makes them the “other.” When participants took a moment to share their experiences of dealing with immigration officials, it was a sad but moving affirmation that this type of workshop is absolutely necessary, even as we continue moving toward serious reform of the system. One young woman told the story of her home being raided by Immigration and Customs Enforcement (ICE) at 5am. ICE officers were told immediately that her father, who was working two jobs, had already left for the day yet they proceeded to ravage the family’s home in an aggressive and unruly search. An even younger girl spoke of her father being arrested and detained while they were driving home from school. She was left at the police station until other family members were able to bring her home. Imagine a room full of people with the same sort of scarring memories. These types of stories create a sense of fear and shame in the undocumented community to which no person or group of people should be subjected. Having personally dealt with this, Alaa Mukahhal and Cindy Agustin gave a stirring presentation on youth empowerment and finding alternative methods of challenging the immigration system. Their insistence for undocumented individuals to assert themselves in the efforts for reform was bolstered by the legal advice that should help these individuals protect themselves and their families. The workshop ended with questions and answers, and an opportunity for everyone present to break bread together. While our goal is to hold another workshop in the near future, we wanted to be sure that everyone present not only left with their own notes but a packet of resources that they could share with family and friends, and use for themselves in the case of an emergency. It included copies of each presentation, a listing of organizations that provide free support, as well as bona fide lawyers that have a good reputation and history of helping people fight deportation cases. Our goal moving forward is to continue providing resources that help undocumented individuals know their rights and protect their families even as we ultimately fight for a comprehensive reform of America’s immigration system.